You no longer have to chose between ante natal options. The best of ante natal care all wrapped up in one course. Independent multi disciplinary health professionals supporting you with bump and beyond. No longer choose between ante natal courses. The best of ante natal care all wrapped up in one course for you and your birthing partner. Course brought to you by our multi-disciplinary experienced healthcare team. 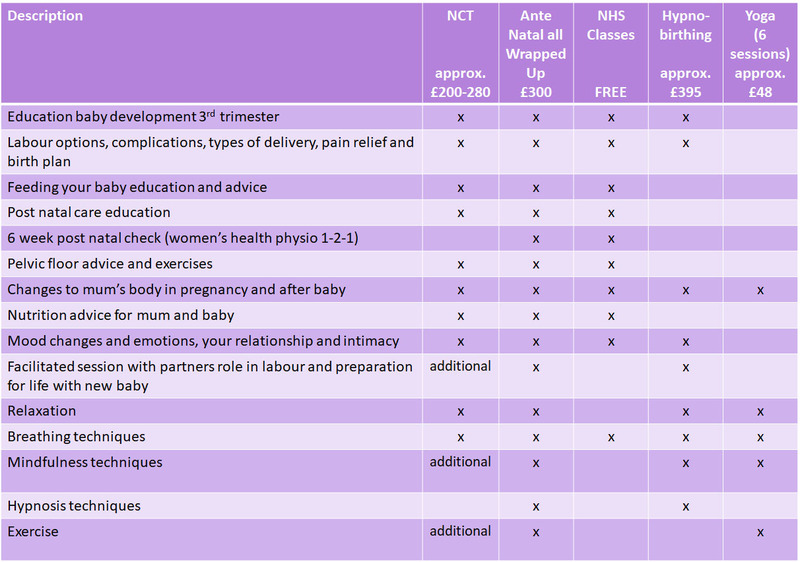 Course for both you and your birthing partner, held at The Oxfordshire Golf Course. Next course date 7th October 2018. Exercise classes incorporate relaxation, mindfulness and hypnosis techniques to help your mental focus, relieve stress and any anxiety you may have. Tailored to positive birthing strategies to help you connect body and mind before, during and after having your baby. A fusion of Yoga, Pilates and low impact functional exercise. 6 classes held in Haddenham, Buckinghamshire. Fridays 6:30-7:30pm or 7:30-8:30pm. Flexible online booking convenient for you. Birthing partners welcome to some classes, held Fridays so you can meet for drinks after class. 6 week holistic post natal check carried out by our Women’s Health Physiotherapist. Disclaimer: Course prices and content are guides only. This checklist is not an exhaustive list of the content for each package. You are advised to research with each provider their ante natal course content before choosing the package that is right for you.